A few years ago, I produced my first sketchnote at a visual note-taking workshop led by the lovely Eva-Lotta Lamm. Since then, I’ve done more than a hundred sketchnotes over two dozen or so events across 5 different countries with no intention of stopping. I do it primarily for the challenge, the intimacy from being immersed in ideas, and I’ll admit, the compliments I get from onlookers, peers and experts. But the value I get out of it is so much more, because the most rewarding thing about sketchnoting is not about its product, but its process. Active participation enhances our learning, but in broadcast situations like talks, panels, speeches and shows, it’s all too common to sit back and watch, listen, reflect, and question. 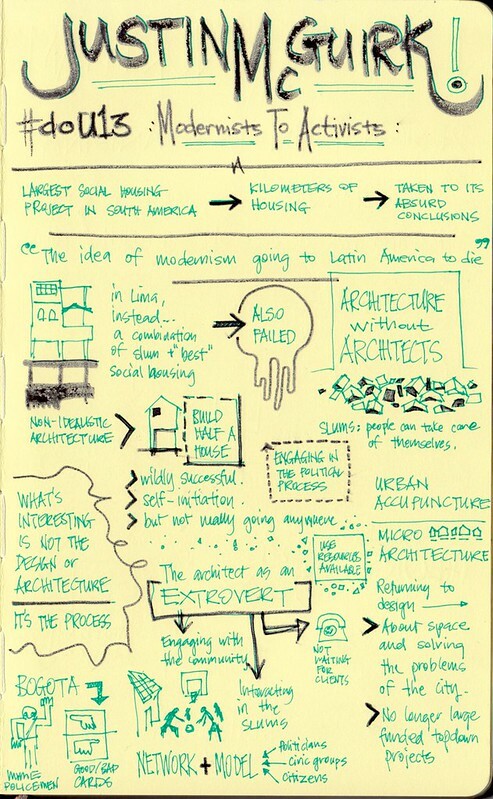 Sketchnoting turns that on its head and allows you be part of that experience. So while it’s nice to admire interesting sketchnotes as an output, but even better to experience sketchnoting for yourself. Visual notetaking is a skill that has to be learnt. You don’t need to be an art student to be able to do sketchnotes, but you have to be willing to stretch yourself a bit and visualise things that you “see” in your head onto paper. This takes a bit of practice, obviously, but you can get up to speed by using some tips and tricks like Dave Gray’s approach to drawing things and people, choosing a framework or template to structure your notes, or using different types of pens to create depth and hierarchy in your notes. Just like learning another language, and it shouldn’t take you too long to build up a basic vocabulary. Drawing portraits, abstract concepts and complex objects will of course take more time but at the end of the day, every little thing you draw is an investment you make in participating in the experience, which pays back in dividends. I think sketchnotes is a lot like sketchbooking, where it forms part of your existing creative process and journey that develops over time. Just as artists use sketchbooks to develop their ideas, capture observations, and refine their thinking, sketchnoting allows a UX practitioner to be more focused, critical and reflective about what’s being learnt from the content. It’s pointless, therefore, to see the whole picture by looking at someone else’s sketchnotes — just as you wouldn’t piece together the Mona Lisa by looking at Leornado’s sketchbooks. The output then becomes a byproduct of the note-taker’s experiences, thoughts and learnings. Some are more communicable, and some are more personal. That shouldn’t stop you from making your sketchnotes memorable and interesting as that helps with socialising your ideas. At the end of the day, what matters most is what you take from it over time as you mature as a practitioner. I’m really passionate about sketchnoting as a means to improve learning and visual communication. I run sketchnoting workshops with General Assembly from time to time – the next workshop is on Oct 21. I’ve also produced a follow-up post on Learni.st on getting started with sketchnotes for folks who have not tried their hand with sketchnotes and want a quick way to get started. Have a look!